On Comex SILVER and GOLD PRICES barely breathed. Silver closed down 1/10 cent at $14.158 and gold lost $3.80 to $1,070. Silver made another low at $13.99. 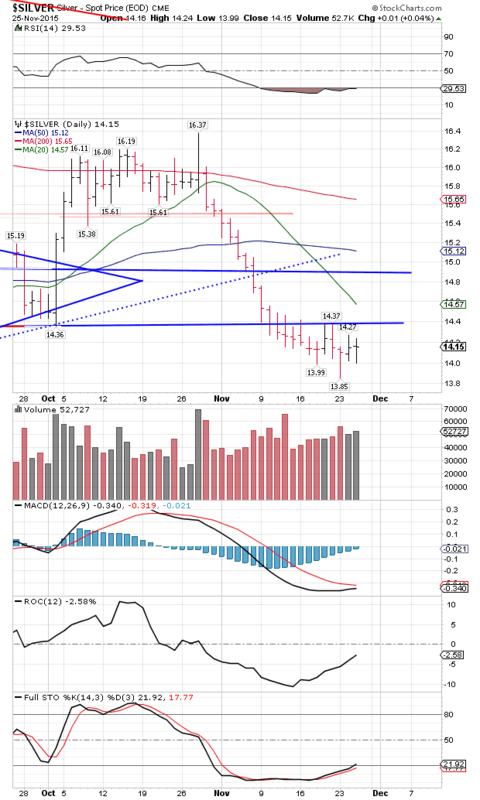 You’ll see the silver price chart MACD is turning up, along with Rate of Change and full stochastics. RSI is plumb oversold, and has been since 9 November. Ripe to turn around. 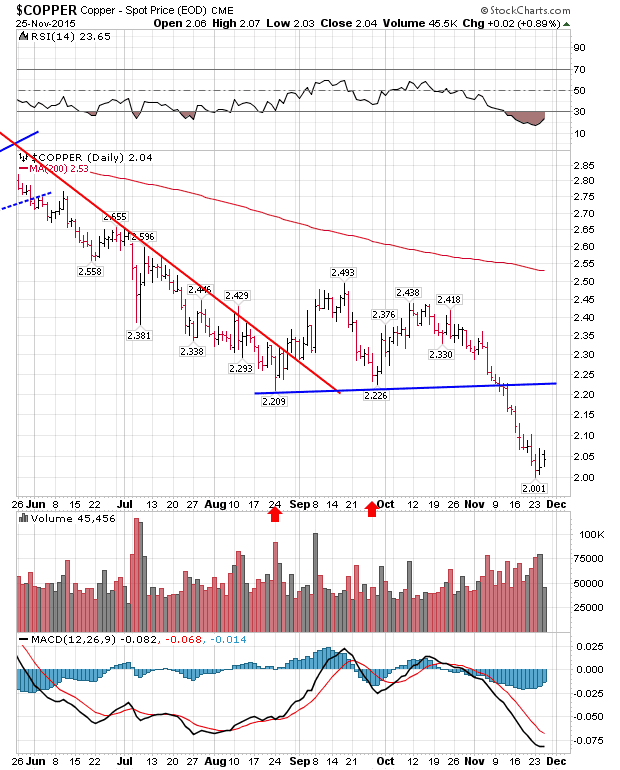 Gold’s RSI is not quite as oversold, but other indicators are also turning up. Five day/15 minute charts went a little lower than I wanted, but did not violate the lows seen on Monday. Whoa! So we have a bottom, followed by higher highs and a higher low, an embryonic uptrend. I bought silver yesterday and a little gold today. I may end up choking on it, but at least I eat my own cooking. Markets are dead in the water ahead of the Thanksgiving holiday in the US. floor traders might try some tricks in Friday’s thin markets, but that won’t stick, up or down. Stocks sawed back and forth without gain. S&P500 lost 0.27 to 2,088.87 while the Dow Industrials gained 1.2 to 17,813.39. No movement, no significance. US dollar index climbed to a new intraday high for the move since October at 100.23, and a new high close at 99.82, up 24 basis points. These are marginal moves, and clearly for now the dollar is stalled. Vulnerable to a sudden drop if spooked. What might spook it I couldn’t say, if Turkey, arguably a surrogate for the US, shooting down a Russian warplane won’t do the job, and it hasn’t. It appears, by the way, that Obama and Company are in fact stupid enough to embroil the whole world in a war. Better pray they wise up fast. Euro lost 0.25% to $1.0618. Yen lost 0.14 to 81.48. Just looking at their charts makes you want to reach for the wastebasket and puke. Here’s a strange omen, flashing big and bright across the firmament. 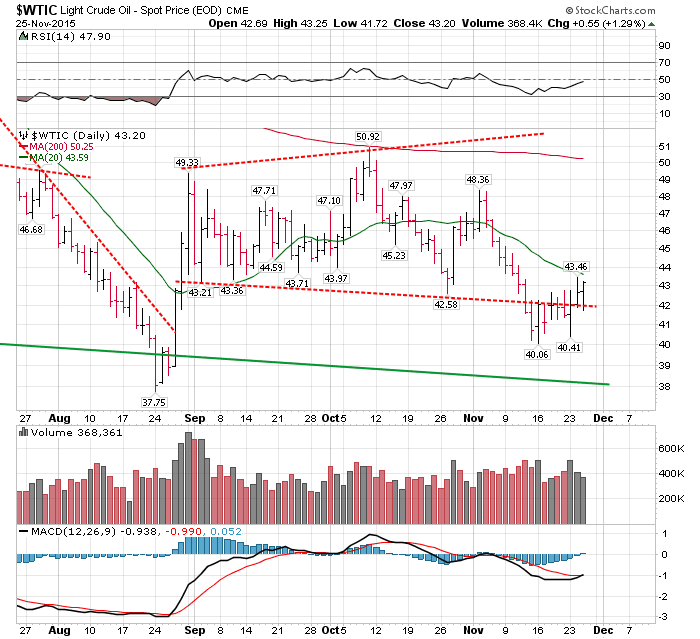 Oil (WTIC) today closed above its 20 day moving average, having fallen down out of its trading range and trading back up into it. Closed up 4.08% at $44.39. Copper, too, has bounced off $2.00. It’s RSI is so oversold that it looks like a big old black and blue punk knot on somebody’s pumpkin head. I mention these two inflation markets because most everybody in the world, including ventral bankers and their economists, who don’t know an economy from Adam’s off ox, expects what they call “deflation” and lower commodity prices. What if the market surprises everybody? What if we are watching now not only bottoms in silver and gold prices, but in other commodities as well? No turnaround has appeared yet, just these little clouds the size of a man’s hand on the horizon. One thing that might tip it over is the Fed failing to raise rates in December. That would pull the plug out of the dollar’s heel and send commodities flying. May you all enjoy a blessed Thanksgiving and a grateful heart for all God’s mercies.